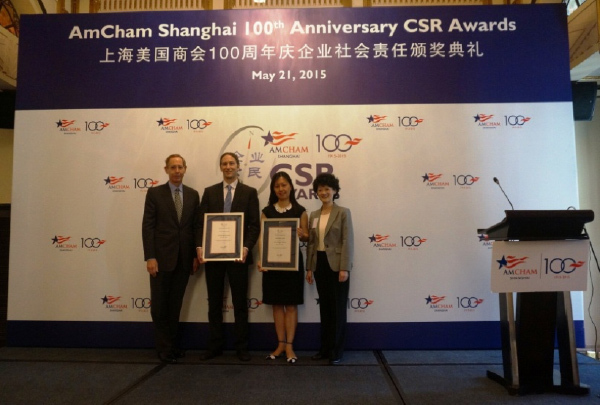 Shanghai, China, July 2, 2015 – United Technologies Corp. (NYSE: UTX) and The Library Project (TLP), has jointly received the Partnership Award of 2015 AmCham Shanghai CSR Awards granted by the American Chamber of Commerce Shanghai. 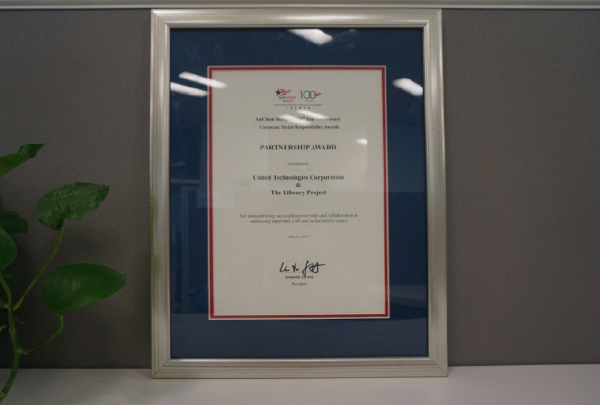 The Partnership Award recognizes the successful collaboration between United Technologies and The Library Project through the UTC China Library Project and celebrates their contribution to improving education in the rural areas of China. 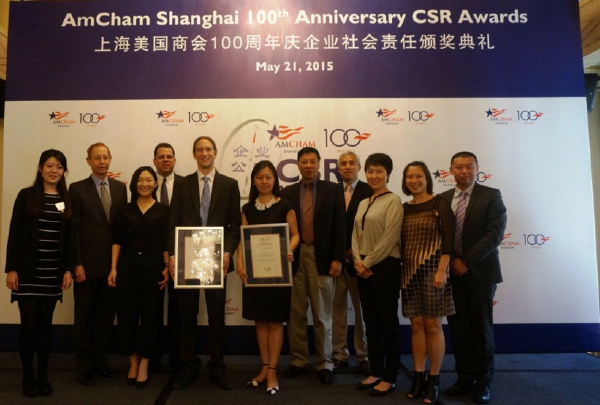 AmCham Shanghai began granting the Annual Corporate Social Responsibility (CSR) Awards a decade ago, recognizing the organizations and individuals who made significant contributions to enhance corporate citizenship and raise sustainability awareness in China. This year, more than 40 organizations and individuals participated in the nominations and the winners have been selected through a judging panel of community affairs experts, business executives or non-profit organization leaders. “The partnership between United Technologies and The Library Project demonstrates the success of collaboration between a corporation and a non-profit organization in building sustainable communities through advocacy of education and empowerment for the young generation.” stated Professor Zhiyuan Yu, School of Social Development & Public Policy, Fudan University and judge of the AmCham Shanghai CSR Awards. “The UTC China Library Project has been proven a great success. The impetus to their achievement comes from the strong commitment of their leadership, robust employee volunteer activities and good communications between the two organizations.” added Professor Yu. United Technologies and The Library Project have been working together through the UTC China Library Project since 2011. Since then, United Technologies has invested more than RMB6.71 million and donated 327 student libraries and 90 teacher libraries to elementary schools in 14 provinces throughout China. A total of 217,750 books were provided to benefit 69,800 students and more than 4,300 teachers. United Technologies China employee volunteers and The Library Project staff have made 160 visits to the rural areas to fulfill the donations and bring the joy of reading to the students and teachers. Funded by United Technologies, the UTC China Library Project donates student libraries and teacher reference libraries to elementary schools in China’s rural areas. A student library is equipped with hundreds of children’s books that cover a broad range of subjects from fairy tales to history, from safety knowledge to science education, and from school reference books to a full set of children’s encyclopedias. A teacher reference library includes books such as children’s psychology, children’s education and many others. “Of all the applications, the UTC China Library Project shows the best interactions between the partners, and clear benefits to each as well as to the ultimate beneficiaries, teachers and students in rural areas.” said Gregory Berzonsky, Vice President, United Way Worldwide and judge of AmCham Shanghai CSR Awards. Along with its growth in markets around the world, United Technologies believes that corporate responsibility and financial performance go hand-in-hand. United Technologies’ community engagement is focused on building sustainable cities, advancing STEM education and supporting vibrant communities. With more than 23,000 employees in China, United Technologies has a long history of supporting sustainable development in China. The Library Project is a non-profit organization that donates books and libraries to under-financed schools in the developing world. Up to now, The Library Project has donated one million books to elementary schools in the remote areas of China. The Library Project is a charity partner of the China Population Welfare Foundation: a non-profit charity organization registered with the Ministry of Civil Affairs.